he obvious insinuation contained in the above question is that "since it takes on average one million years for photons created in the sun's core to escape from the sun's surface," the age of the Earth can't possibly be the less-than-10,000 years that biblical Creationists claim. In response to the question, let's establish the facts and dismiss erroneous claims. First, those "million-year" time frames would be valid only if the present knowledge and models are correct. If what people today think they know is wrong, then what they derive from this is going to be just as wrong. Specifically, the figure of "one million years" is not a direct measurement but rather a computed result based on present models and understandings. It is far from being an established fact that those models and understandings are correct in every detail. 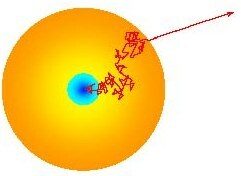 Light-transit models typically include that light escapes the sun's core through a series of random steps as it is absorbed and emitted by atoms along the way (Courtesy - Richard Pogge, Ohio State University). Therefore, even as per mainstream estimates there are no "millions" of years in the transit time of solar photons. Furthermore, those computed values of 10,000 - 170,000 years are valid if and only if the multiple models (e.g., random walk, solar interior, etc.) that are used are correct in every detail. It is unwise and unjustifiable to assume that such infallibility is the case here. Third, let's analyze the situation a little closer. When God created the sun, it was a mature star from the start. In other words, God created the sun to be functional from the very first moment, not thousands or millions of years later. Adam was created as a mature person, not as an embryo; trees were created fully grown, not as seedlings. In like fashion, God created the sun as a fully mature, extremely hot body of gas emitting photons not just from its core but from every layer of its structure, including the surface. Recall that the sun's surface temperature is approximately 5,500 �C and, thus, matter there exists in the plasma state emitting photons. In summary, these simple points demonstrate that solar photons could certainly have been arriving on Earth moments after God created the sun, not millions of years later as certain people claim. At the very least, it has been demonstrated here that this objection to biblical Creation is extremely weak and flawed.